The Obsidian Theatre Company presents the belated Canadian premiere of August Wilson's The Piano Lesson, 1990 winner of the Pulitzer Prize for drama. Set in Pittsburgh in 1936, the play focusses on the struggle between a brother and sister over a family heirloom, an upright piano embellished with pictures of the family's history carved by the siblings' grandfather while in slavery. Berneice wants to keep it as a reminder of the family's sacrifices. Her brother, Boy Willy wants to sell it to buy the land his family once worked as slaves. The central conflict thus epitomizes and universalizes a dilemma of the African-American experience--to hold on to the past or to obliterate it and move forwards. The piano becomes a powerful symbol of heritage as both treasure and burden. This symbolism, Wilson's poetic language and his vivid characters are the play's strengths. Its structure, though, is problematic. Too many scenes let the characters shine without moving the plot forward and a romantic subplot near the end goes nowhere. The brother-sister conflict never changes, each flare up repeating but not developing the argument. Although spectacular, resolving an otherwise kitchen-sink drama via supernatural intervention (a ghost) is not emotionally satisfying. Despite this, excellent performances from the whole cast command our attention. Under director Alison Sealy-Smith they relish the complexity and detail of the characters giving them a lived-in feel. The charismatic Michael Anthony Rawlins is outstanding as Boy Willy, who uses all means from charm to force to attain his prize. Yanna McIntosh communicates a wealth of subtext beneath even the simplest lines. Walter Borden as their uncle exudes the calm deliberation and humour that the young people lose sight of in their struggle. 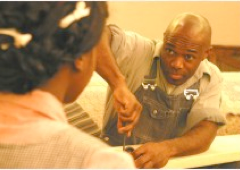 The play is part of Wilson's decade-by-decade cycle examining African-American life in the 20th century. Let's hope Obsidian explores the others. Note: A version of this review appeared in Eye Weekly 2003-02-13. Photo: Yanna McIntosh and Michael Anthony Rawlings. ©2003 Obsidian Theatre Company.